VisionCheck is powered by MIT patented technology called Inverse Shack-Hartmann. The VisionCheck projects images from your smartphone screen through your pupil and onto your retina. Your refractive error (nearsightedness, farsightedness, and astigmatism) causes you to see these images in a certain way. 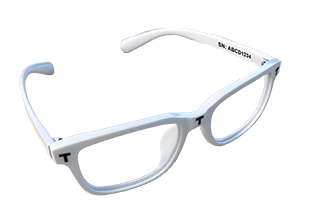 Based on the way you conduct the vision test, our technology calculates your EyeGlass Numbers; the power needed to correct your refractive error. Specifically, two lines (one red and one green) are projected onto your retina. Your goal is to overlap the lines to achieve one solid yellow line. As you overlap the lines, based on what you see, the VisionCheck calculates how far you’ve moved the lines, giving you an accurate measurement of your vision. There are nine total measurements taken for each eye. After each measurement, the optic lenses will rotate internally to present and gather a meridian of the eye. 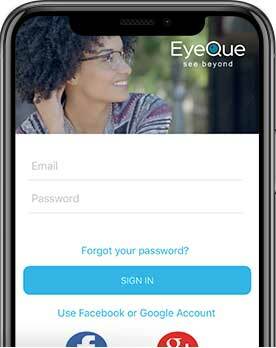 Once you’ve completed the testing on each eye, your measurements are calculated in the EyeQue Cloud, taking into consideration your specific inputs including any previous tests that you’ve taken. What is the warranty of the VisionCheck?